This interactive Bible study journal will maximize the quality of your quiet time with God by helping you to creatively apply what you study in His Word to your life through easy-to-follow steps and thought-provoking questions. 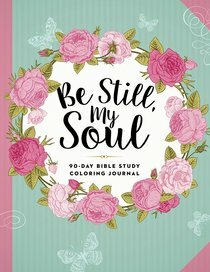 About "Be Still, My Soul - 90-Day Bible Study Coloring Journal (Adult Coloring Books Series)"
This is a wonderful way to absorb the wealth of inspiration to be found in God's Word. Inside are 365 Bible promises integrated with beautiful designs to colour in. 14.5 x 16cm. Zondervan Adult Colouring Books feature detailed line-art illustrations to colour in, each paired with a key Bible passage or inspirational hymn lyrics. The perforated pages are made of high quality bleed-proof paper stock. This inspirational 96-page colouring book will help you relax creatively. Fill intricate images with the beauty of colour while being refreshed and renewed as you meditate on God's Word. Handy sized for colouring wherever the go!